My phone rang on a Saturday morning in April 1997. I was still asleep, but my answering machine picked up. "Chris, this is Matthew. I work with your producers," a voice from the machine said. "We've gotten an offer on your script, Firestorm, and we think we're going to take it." "What?" I said, trying to wake up. I hadn't been sleeping very well because I had been preparing the Firestorm script for the marketplace. It was the first of my screenplays to attract such strong interest from a major agency, a management company, and a producer. And I was still in the graduate screenwriting program at The University of Southern California. Firestorm was my thesis screenplay. I phoned my attorney. Luckily, he was in the office that Saturday. Hollywood doesn't usually do business on the weekend, but it's not unheard of. Sometimes, a script is leaked to an overeager studio and they make a solid offer to preempt a bidding war. So this was it. Six months earlier, I had been driving cross country with a friend, helping him move from New York to California so he could become a screenwriter as I was trying to be. We took the northern route to visit my family in Wisconsin and Minnesota, and we passed through Yellowstone National Park. There had been a million-acre forest fire there in 1989, and huge parts of the park were still black and charred. It looked like a lifeless moonscape, and the only thing scarier was imagining what it must have been like when it was burning. When we arrived in LA a week later, I saw a story that night on the news about a group of firefighters known as smoke jumpers. They had died in the Storm King Mountain fire that summer. Who were these smoke jumpers? Did they really parachute into forest fires? There had just been three movies all about skydiving, a topic that was exciting enough to make a movie about. What if a safe landing were only the beginning? I was an action writer in the post-Die Hard years, when many scripts sold because they had an interesting setting featuring a hostage situation. I rarely walked into a room in the '90s without thinking, 'How about Die Hard in here?' I rarely found anything good. It turned out that smoke jumpers were real American heroes. They would skydive into blazing forest fires in remote areas to control them before the fires could endanger life and property. Fifteen smoke jumpers had died that summer. I had my setting and my hero, one we hadn't see before. And I had a dark and haunting episode for my hero's back story, his 'Nam experience. This back story could haunt him with survivor guilt, the feeling of failure from which he could redeem himself during the course of his story. Yellowstone seemed like the perfect setting, with cliffs, raging whitewater, and over 10,000 buffalo that might stampede if a fire broke out. Let's not forget geysers, including Old Faithful, which erupts every 45 minutes like clockwork. And I had fire. Film loves fire, the way it dances, the fact that it's a sustained explosion with light and substance, motion and menace. Fire was a vital character to the drama. Fire made the setting a menace to my hero, as well as the villains. But there was a problem. Who would be my villains? You could rob Yellowstone Park, I reasoned. There had to be money there during a big holiday weekend. But how did fire relate to robbery? A crazy arsonist could set a fire, but then what would happen? Hitchcock said, "A thriller is only as good as its villain." Films like Die Hard were only as good as the villain and his plan. Fires, stampedes, and explosions were pearls. But my villain, his plan, my hero and the arc comprised the string on which to hang the pearls. The California Manual of Wilderness Fire Suppression , which was dry. But it held my answer. It contained a graph of best firefighting practices. The graph helps when determining what measures are appropriate for fighting fires of various sizes. The fire suppression manual also said prison inmate fire crews could be employed for fires covering 11,000 acres or more. If a forest fire gets big enough, the U.S. Forest Service will empty out prisons to fight it. That can create opportunities where prison inmates can escape, take hostages, and engage in all sorts of chicanery and mischief. I had my string. The rest of the writing process was comparatively easy. They teach a method of story outlining at USC—and nowhere else—called ' sequencing.' With this method, a two-hour movie is broken down into eight fifteen-minute segments, each a discrete chapter in the story. By using this template as my guide, I'm able to outline my story and decide on the order of events. This process is often a nightmare for other writers, but 'sequencing' makes it a pleasure for me. The pearls presented their own problems, but when I had found them and a few other ingredients, putting them in order on the string was easy. My thesis instructor demanded 20 pages a week and a first draft in 6 weeks. I was in full-time graduate school , but it was still a blistering pace. I was the only one in my thesis group who kept it up, rewriting from the group's notes each week and churning out a fresh 20 pages. It took 8 weeks. The first and last sequences each required a full week of rewriting. Then things started to happen… My thesis instructor was able to help me out with his contacts at a major literary agency and management company. A minor studio had just made the first 20-million dollar deal for an action movie with a major star, and they had no script. I seemed to be in the right place with the right script at the right time. It was the perfect storm. And that was how I received a phone call at 8:00 a.m. on the first day of April. The script wasn't sold that Saturday. But, it was sold for three quarters of a million dollars the following Tuesday. I couldn't have achieved success without the writing methods I learned at USC. I couldn't have done it if the U.S. Forest Service didn't use convicts to fight the biggest fires. And it never would have happened if I hadn't driven cross country with my friend. 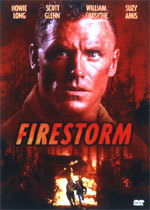 Chris Soth's movie, Firestorm, was released in 1998. He has worked as a screenwriter in Hollywood ever since, teaching at USC and UCLA. He privately teaches his own refined version of 'sequencing' and refers to it as 'The Mini-Movie Method.' During the first weekend in June, he will teach 'The Mini-Movie Method' at his seminar, which is described in detail on his Web site, MillionDollarScreenwriting.com . Email Chris@MillonDollarScreenwriting.com for the Scriptologist.com discount on the seminar.